As a Welcoming Congregation, we intentionally welcome people who are Lesbian, Gay, Bisexual, Transgender, or Queer (LGBTQ), as well as those who are Questioning and their Allies. Second Unitarian wishes to extend a special welcome to those searching for a religious home that welcomes their full identity. 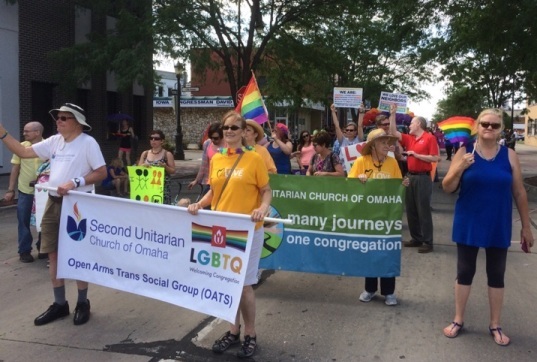 Our congregation works with Omaha-area organizations as well as other LGBTQ-friendly congregations to support equal rights for all people without regard to their sexual orientation or gender identity. LGBTQ Justice Work – We monitor and research city and state-wide legislation affecting LGBTQ people. We coordinate panel discussions, host informative speakers and conduct worship services in support of National Coming Out Day. Our congregants march in the Heartland Pride parade and host booths at Pride and other LGBTQ-focused events. Trans Social Group – In early 2012, our LGBTQ Welcoming Congregation Committee saw a need for and initiated a support group for transgender youth and young adults in the Omaha metro area. Named the Open Arms Trans Social Group (OATS) by its participants, group members support one another at monthly meetings by sharing not only their hopes and concerns, but also potluck meals, clothes, advice, resources and emotional sustenance. Today, OATS draws young people from well beyond the Omaha area. One participant travels more than 200 miles round trip to gain this much needed support. 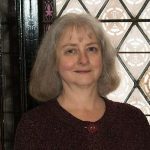 Some participants have come to Sunday services and have participated in other church events; one has joined our congregation because of the acceptance she felt from the group and the congregation. Visit the Open Arms Trans Social Group website at openarmsomaha.com. National Work – Learn more about the Unitarian Universalist Association’s LGBTQ justice work. Our LGBTQ justice work is coordinated by our Social Justice Committee, which typically meets after the worship service on the third Sunday of the month.